Every day is Earth Day. Especially in Pemberton, where we love dirt more than most, and just annihilated our neighbours in the Earth Hour challenge. 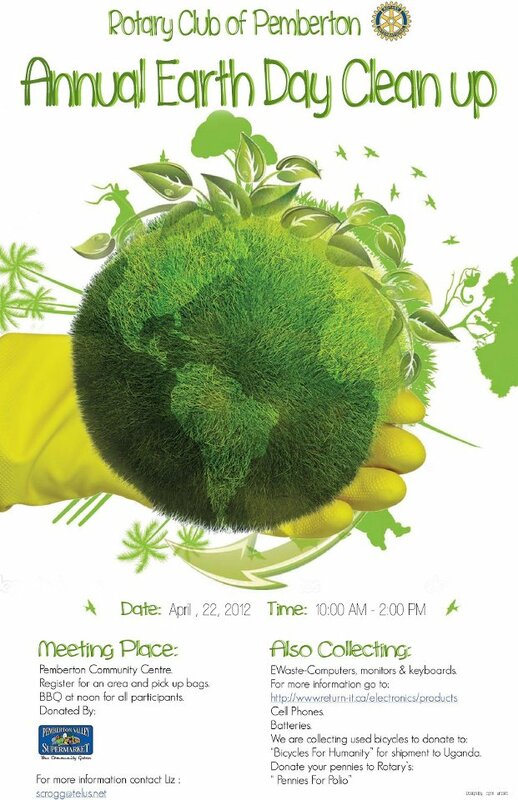 But this Sunday, April 22, is an extra-good opportunity to take part in a global spring clean. It’s not just a chance to clean up around town, but to clean out our garages, attics and penny jars… Whatever you have been saving those pennies for, the moment has come to give them over. They’re not even currency any more. For Earth Hour, people are meant to turn off all power for an hour. How does an Earth Day challenge work? Earth Day is April 22nd every year. Rotary has done annual Earth Day cleanups for years. It’s not really a challenge, although there may be a challenge taking place between businesses. I think we should do something to help the environment every Earth Day! What does Earth Day involve? An annual clean up around Pemberton, and we have included a few new things this year. We are asking volunteers to help clean up several areas of town. We thought it would be great to offer the chance to get rid of electronic waste. We are working with the new owner of the Bottle Depot. Encorp now collects E-waste so we joined forces with him. There will be a bin at the Community Centre for you to drop off your items. We also are working with SLRD to collect used household batteries and cell phones – we must keep these items out of the landfill! We thought it would be great to allow people to get rid of their jars of pennies since they will no longer be a usable coin. We are collecting the coins as a Pennies for Polio campaign. We will roll the money up and send it to Rotary. I also wanted to start a collection of used “fat tire” bikes for Bicycles for Humanity in Whistler. If we find any bikes (there is one in Arn Canal) or if people clear them out of their garage, we will take them to Whistler for their program – they are shipping bikes to Uganda. How many people do you anticipate? We would love over 100 people to take part. Who made that skookum awesome poster? My step daughter Tegan Turcotte. 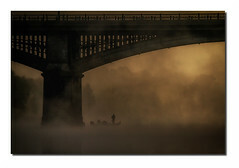 She’s a grad of Whistler High School and the Art Institute in Vancouver. Why should people go out and pick up garbage around town? Don’t we hire muni staff to do that? Yes, there are muni staff but they don’t walk every trail or street in town – the staff typically empty the garbage cans. Picking up garbage around town is just the right thing to do. What is it that is motivating you to take part? What do you think people will get out of it? Apart from the free BBQ! People like to help and feel good about helping. We have a generous donation of food from the Pemberton Valley grocery store so we can thank the volunteers! Absolutely. We encourage youth to participate. It can be an eye-opener when they see the volume of waste around the town. Also it’s great for youth to be exposed to volunteer work at an early age. Should people wear anything in particular? Be prepared for the weather. Wear sturdy shoes. We will supply gloves and bags. What if people can’t commit the entire 4 hours? We are happy if people can get out even for a short time. You don’t have to commit to 4 hours. 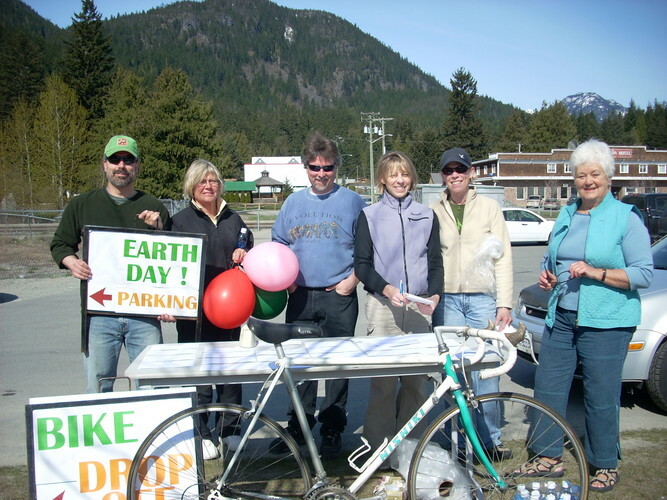 Some years, Earth Day has been a big thing in Pemberton. In 2010, the Village and Stewardship Pemberton got on board and it was a huge party… but it has consistently been an event that the Pemberton Rotary Club has run since 2002. Why? We are a hands-on club and we like to get our hands dirty. It has become one of the things we do. What other events and projects does the Pemberton Rotary Club work on? Rotary just had a wheelchair accessible picnic table installed along One Mile lake trail. We are working to complete the kitchen at the Community Centre in partnership with Friends of the Library, the Seniors Society, and the SLRD/PVUS. Our annual golf tournament is on June 22. We sell flower baskets every year for town businesses and residents. We are just completing a review of new projects and fundraisers – we’ll have more to share in a few weeks! Finally, what is it that you love about Pemberton? Great community spirit and a high rate of volunteerism. It’s a very giving community. The town really rallies around good causes, people are very generous, and the place is beautiful! Where can people go to find out more about the Earth Day event? And where can they go to find out more about Pemberton Rotary?